The open access movement has failed. Self-archiving and open-access journals are struggling to deliver 100% open access and probably never will. Moreover, readers, the curious minds it was hoped research would be opened to, have been marginalised from the debate. Toby Green suggests an unbundling of the often disparate, distinct services required by readers and authors; a new model for scholarly communications based on Doctor Dolittle’s “pushmi-pullyu”. The specific needs of authors preparing their papers and data for publication can be serviced on one side of the pushmi-pullyu; while on the other, freemium services ensure research is discoverable and readable by all, without payment, and a premium layer of reader-focused services ensures the evolving needs of readers are met. On Valentine’s Day, 2002, 16 stakeholders from the scholarly communications industry signed the Budapest Open Access Intiative, calling for free, unrestricted access to scholarly journals by “scientists, scholars, teachers, students, and other curious minds”. They said: “removing access barriers to this literature will accelerate research, enrich education, share the learning of the rich with the poor and the poor with the rich, make this literature as useful as it can be, and lay the foundation for uniting humanity in a common intellectual conversation and quest for knowledge”. This launched the open access movement. As I argued in my recent paper, the open access movement has, so far, failed: of the approximately 2.5 million scholarly papers published this year, perhaps 20% will be freely available to curious minds on publication. The Budapest 16’s recommended strategies, self-archiving and open-access journals, which took shape as Green and Gold open access respectively, are struggling to deliver 100% open access and probably never will. My paper suggests some reasons why and while I will not repeat myself here, I would like to draw attention to one actor who has been missing from the movement all along: the reader. It is assumed that the reader benefits from open access, but where’s the evidence? Open articles may or may not have a citation advantage so whether readers are benefiting from an acceleration of research is still not clear but, for want of studies, evidence of reader benefits is lacking. In my own experience with OECD’s publications, I know that making content free expands the number of readers, which suggests more with curious minds are accessing the content, but even if all content was free to access, would this alone meet the goals the Budapest 16 set out for open access? And how many of those accessing OECD content understand it and find it useful and actionable? Bringing scholarship to scientists, scholars, teachers, students, and those with curious minds (practictioners, thinkers, local communities, civil society organisations, policymakers) is surely vital if we’re to improve our societies, and policymakers are indeed pushing for a broader definition of impact beyond citations. I think the number with curious minds is much, much larger than many assume. One indicator: 43% of 25-34-year-olds in the 35 OECD countries have tertiary degrees, as do just over a quarter of those in their 50s. Taking those in non-OECD countries and the degree-less curious who are just as capable, we’re looking at a potential readership in the millions. So, the audience is there, but how are we doing in making the content discoverable and understandable for them? Let’s look at Green open access from a reader’s perspective. She-with-a-curious-mind starts with a Google search and finds a link to an article on a publisher’s site. Clicking through, she hits a paywall. Undeterred (which is, of course, the unlikeliest scenario; most will give up) she searches again for a self-archived version. Because of embargos, if the article is less than a year old, she has perhaps a 20-30% chance of success. If the article is older than a year, perhaps a 45% chance. Let’s imagine the gods are with her, and she finds the self-archived version, how can she be sure it is identical to the version of record (VoR)? Of course, she can’t check because the VoR is locked behind a paywall. Any Silicon Valley start-up would rightly toss out the idea of Green open access as it is not only the opposite of user-centric but also expensive (since it requires two parallel workflows: one for the self-archived version, another for the VoR). Let’s turn to Gold. Our friend with the curious mind has just a 14% chance of the article she’s searching for being in a gold journal – not great odds. Can you imagine how successful Spotify would be if the chances of finding something you wanted to listen to was just 14%? Or if Amazon only sold 14% of books, or Booking.com only had 14% of hotels? There’s more. If the objective is to reach those with curious minds – surely an urgent and vital aspiration in this post-truth, fake-news world – how much of scholarly literature is both accessible and understandable beyond a small cohort of experts? Being freely available has no societal value if only an elite few can benefit from the knowledge presented. The failure of Green and Gold to deliver open access has opened the door to Sci-Hub, a pirate aggregator of 85% of all scholarly literature. Sci-Hub’s rapid success in attracting readers suggests it is more in tune with readers’ needs than any other stakeholder in scholarly communications. As with many digital businesses, that an outsider does a better job than insiders is not a surprise: music publishers didn’t develop iTunes or Spotify, booksellers didn’t launch Amazon, the tourism industry didn’t create TripAdvisor. If the open access movement’s preference for Green and Gold proves to be a dead end, what’s the solution? I don’t have the answer, but will throw out a couple of ideas. A back-of-an-envelope calculation – with due credit to Simon Inger for this idea – guestimates the global revenue per journal article download to be around $1 (a $10bn industry, with ±3.5 million researchers each accessing ±270 articles a year = ±10bn downloads). This works out at $22.50 per month for each researcher to access an unlimited number of articles. However, that assumes the reader population is just the same priviledged few accessing paywalled content today. Even if the total accessing population is only twice as large, the monthly sub would halve to ±$11 per person. How about Amazon buys Sci-Hub and re-launches it as Amazon Prime for Scholars? “This keeps the content behind a paywall!” I hear you scream. Well, it doesn’t have to if the subscription service was, like Spotify, a premium offer on top of free read-only versions open to all. And, for those at institutions, I’m sure librarians would negotiate bulk deals on your behalf as they do today, but for a premium service, not merely for accessing the content itself. If that doesn’t appeal, how about this: scholars post their new papers as preprints in one of the various rXivs and stop there. Readers come and go and, if a preprint wins attention (and only if it wins attention), it is selected by an editor for peer review and subsequent publication in a journal. If the finding that a majority of peer-reviewed articles in orthopaedics never win an audience is just as true in other disciplines, using attention as a pre-condition for being peer reviewed would reduce the volume of journal literature by perhaps two-thirds, taking a huge amount of cost out of the system. Preprints would be free and journal articles available on subscription as above. With only a third of articles making it to formal publication, that reduces your monthly subscription to a premium service to less than $5.00 – which won’t even buy two cups of coffee from your favourite barista. Both scenarios are original because they are reader-centric. In both cases, the reader gains a “voice” (in the form of a subscription) in how the service evolves and so it is likely to improve to their benefit. In the second scenario, reader attention dictates which article goes through for peer review. This might shake up academe’s prestige problem for the better. Empowering readers might also encourage authors to pay attention to getting their work read; promotion efforts can increase readership by 23% yet how many authors today spend time building an audience? Now, I know many will object to these ideas. Fair enough. I am fully aware that I have not discussed copyright or text mining or affordability in poorer communities. This is partly because I do not have the space to do so in this post, but also partly because current efforts to make scholarly content open-access in the broadest sense are plainly failing and, to my mind, have no possibility of success at scale. As the old adage goes: if one finds oneself in a hole, it’s time to stop digging. I think we are in a hole and we need to climb out and think afresh. Image credit: Pushmi-pullyu by istolethetv. This work is licensed under a CC BY 2.0 license. In thinking afresh, I’d like to offer the image of Doctor Dolittle’s pushmi-pullyu. For those who didn’t meet a pushmi-pullyu in their childhood, it’s an imaginary creature with a head at each end, reserving one for speaking and the other for eating (thus allowing it to eat while speaking without being rude). 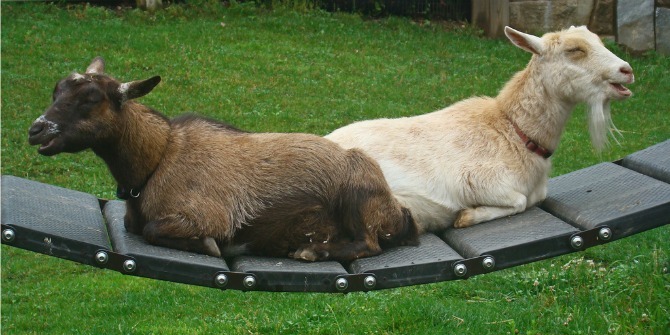 Perhaps, in scholarly communications, our pushmi-pullyu reserves one end for authoring and the other for reading – with each end being serviced by different stakeholders (and therefore stopping them from being rude to one another). Authors need specific services to help them prepare their articles and data for publication. To reach curious minds they need help in making their content understandable and, since they might have to win attention to be formally published, help in promoting their work. The more that is invested in making an article understandable and in promoting it, the more likely it is that work will be read and go on to make an impact among different reader groups – something funders want. For example, at OECD, we help our authors produce 1000-word summaries of many of our publications. Written for a broad audience, they are often translated into 20 or more languages because not everyone Googles in English or can understand it. This is a specific set of services that could be paid for on the author side of the equation and, in paying for these services, authors will ensure that they will become more and more adapted to their needs. Publishers, who have traditionally been author-facing, could refocus their efforts on this end of our pushmi-pullyu. In earning money for providing author services they will not need to “own” rights to the content. The content can be copyright-free, on which anyone can build reader-facing services. Readers need different services. They will want a Netflix-like discovery and alerting system that covers scholarship as a whole, multi-device access, annotation and citation tools, and so on. Non-experts will need plain-language summaries, practitioner- and policy-briefs, ideally in their language. Many will be satisfied with a read-only experience, others will want tools like exporting a chart to PowerPoint. A reader’s productivity will be of interest to themselves and their employer, justifying payment for services that boost it. Like Spotify, freemium services will ensure that the content from authors is discoverable and readable by all, without payment; the premium layer of reader-focused services will ensure that readers’ evolving needs are met. Providers with a passion for meeting the needs of readers are needed at this end of the animal and if content is copyright-free, they can concentrate on finding value in reader-centric services. The fact that such a complex set of disparate and different services for two independent actors is today bundled up into a single business model is, for me, at the root of the failure of Green, Gold and traditional scholarly publishing. What I propose is not double-dipping but unbundling towards a service-orientated future that is at the same time both author-facing and reader-facing, like a pushmi-pullyu. This blog post is partly based on the author’s article, “We’ve failed: Pirate black open access is trumping green and gold and we must change our approach”, published in Learned Publishing (DOI: 10.1002/leap.1116). 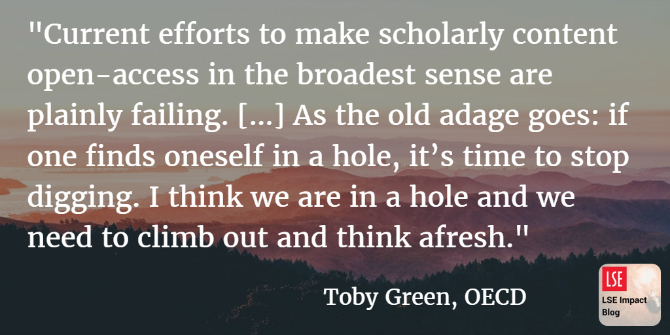 Toby Green has spent 35 years in scholarly publishing working with commercial, society, IGO and NGO organisations on all types of content: books, journals, databases, A&I services and encyclopedias – always with an eye on the reader experience. He writes this piece in a personal capacity and in the hope that it contributes to fresh thinking about how to find a sustainable and effective way to make scholarship available to all. His ORCID iD is 0000-0002-9601-9130. Very interesting post.. I’ve been pondering on this myself as many don’t seem to know about the Green route. Do anyone know how to find these publications that are Open Access? How can we help them find what they’re looking for? I’ve met paywalls many times and given up or emailed the author. I wouldn’t know that finding a version in a repository would even be an option. I do like your idea of having a ‘Spotify’ or ‘Netflix’ design to Open Access. Many people subscribe to these services and don’t mind the small amount they pay, though I suspect that the use and need for scientific research will definitely vary more between people than the need for entertainment. Still, it is definitely time to rethink how we can make research available, and at what price. Thank you for your comment. Sadly, I don’t know of any tool that can help source OA content, although I do know that there are some efforts to help (for example, CHORUS) but they are patchy. Today I heard (via a tweet from the Force 2017 event currently being held in Berlin) that Web of Science is looking to help source OA content, don’t have any details though. Question for you: how much would you pay for a Spotify/Netflix like service for scholarly content? That is interesting. I will definitely check out CHORUS, and keep an eye on Web of Science, thank you for sharing that. I am guessing institutions would have to pay a bigger fee in this scenario, and so the main income in terms of scholarly communications would still be from HE. I am not sure how it would all work out in order to cover all costs of publishing, but I do like the idea of it, and I would definitely subscribe to a service like this (if the price was right). You’re always a source of good ideas, Toby, and these are more of them. The move toward offering services is already under way, of course, with companies like Elsevier leading the way. As I recall, the BOIA statement focused on science publishing and had nothing to say about the HSS fields. Their needs may be sufficiently different, as I believe, that solutions for STEM may not suffice for HSS. Green OA may well suffice for some purposes, like use in classroom teaching, but not in others, like citation and quotation in formal scholarship. As one commenter mentioned, there is always the option of trying to get the VoR version free from the author, which people like me and Stevan Harnard think is perfectly legal.